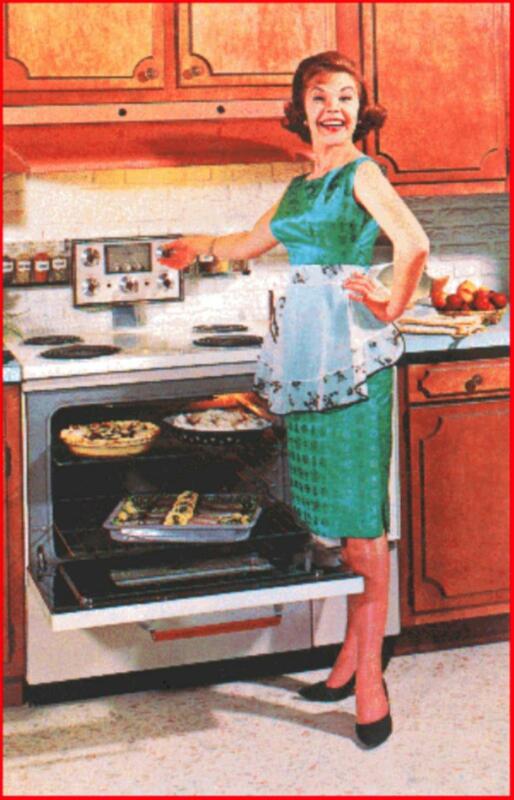 You maybe be asking yourself why this isn't part of The Betty Crocker Project. It's a fair question since tater tot pizza seems like something right up that red spoon alley. But in truth the inspiration for this over the top awesome dinner came from a Twitter exchange I stumbled into with vegan deity Sarah Kramer and John McDevitt - you know might know him as The Laziest Vegan, cruelty-free cover-girl Melisser Elliot and Julia - The SnarkyVegan*... somewhere towards the end I think The Discerning Brute Joshua Katcher popped in. It was a tater tot love-fest/brain storm. Which inspired Sarah to create this lovely Poutine Pizza and for us to enjoy these Mexican Tater Tot Personal Pizzas a few days later. Now we went Mexican with our tater tot pizzas because we had the avocados, jalapenos and salsas and because it seemed like a good way to work a few vegetables in there but really I hope this concept catches on and that we come to see more of these crispy little buddies on all kinds of pizzas in the future. You owe it the 1st grader inside you to make a tater tot pizza at least once in your life... you never let them color anymore. Editing a book is a deceptively slow process. It's the kind of thing that seems to go fast and is pretty easy till you realize you've actually gone through several pages and you don't even remember what you've just read. I've heard of similar things happening to truck drivers with great mix tapes on long highways in Kansas. It's not unlike what happens when you start watching Battlestar Galactica or Sons of Anarchy. Except in those cases, you're so amped up, the blur comes from an overdose of awesome. I've been living lately in this kind of state. I love our book and I think you will too but I hate that I'm a terrible typist*. I find whole sections of the day disappear in a blur of shortening this and formatting that and then more website stuff and more emails. 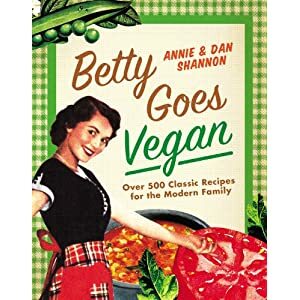 I take breaks to tweet and post updates on our Facebook page but I've lately come to find an even more sincere appreciation for Betty's Quick and Easy Recipes. 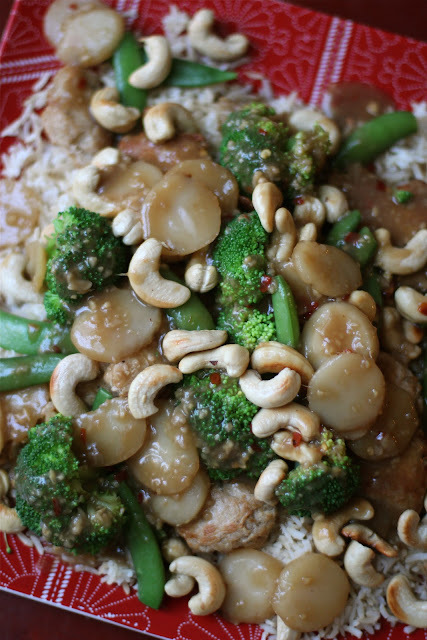 In Betty's recipe, she makes the dish more "healthy" by deceasing the number of cashews (fat) but we went another route. We took out the birds and added vegetables and a lot more ginger. It's a fast and flavorful dinner that made our home smell lovely. No matter what you're busy with right now or what level of chef you are... you can make this. You can do it! So you might be wondering if we're veganizing Betty's Pina Coloda Waffles or her Hawaiian Pancakes. 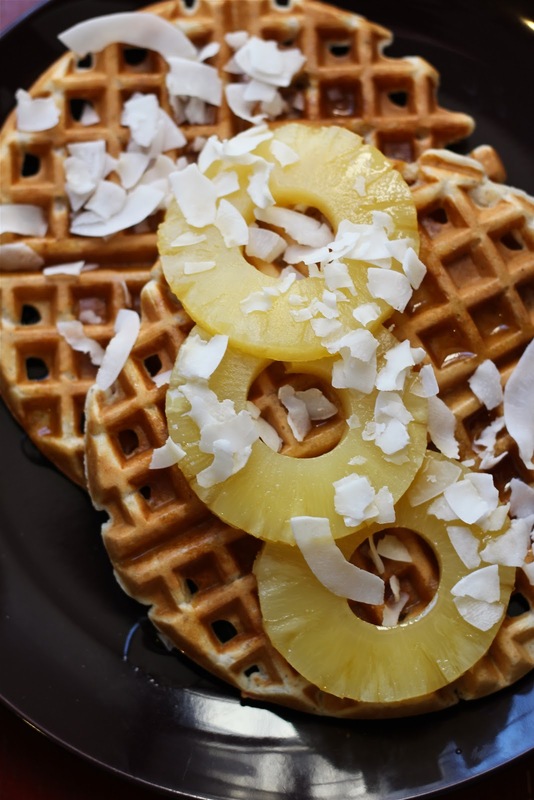 In a way it's both with the added benefit of a little pineapple juice and coconut flour added to the waffle batter for sweetness and our own take on the schamncy syrup to go with it that has a lot less sugar. I think it still has all the fun and flavor of the original but no eggs or cow's milk. Fancy while staying easy*. Sounds like a perfect weekend to me. We're planning a trip to Philadelphia soon to check out the new restaurant HipCity Veg soon. If you know of any other new vegan hot spots or events coming up that we should put on the calendar this summer - please let us know! We're always looking for good road trip tips! OK - Back to waffles! E 'ai kakou! Rome is often called "The Eternal City." A few months ago Dan and I spent a few days in Rome during a freak snow storm that shut down the city. Like most of the city we took advantage of the weather to eat and sample wines. See Rome can be a pretty vegan friendly place with Penne Arrabiata and Marinara Pizza on menu's all over the city. Of course, if you don't trust the servers when they tell you the pasta is eggless, there is always Il Margutta, Rome's most popular vegetarian hot spot. They have several vegan options. Before we left I picked up a ridiculously thick book of Pasta recipes to veganize and I've been playing around with some the easiest and most intriguing ones first. I could say it was a good excuse to work on my Italian but really I just love pasta. Pasta alla Puttanesca is actually called Pasta alla Sorrentina in my book - probably because Puttanesca means something like "whore style." Even with a name like that, this Neapolitan dish is pretty well known and popular in restaurants everywhere. 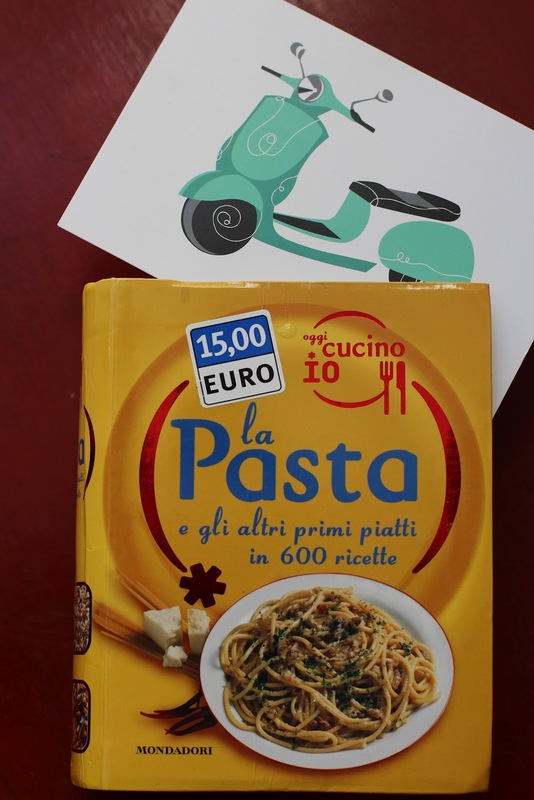 Which is impressive because in Italy's long and well documented history, Pasta alla Puttanesca is pretty new on the scene and for generations was considered "poor people food." It wasn't even mentioned in books till around the 70s and its interpretation doesn't just seem to differ from region to region - but by city and sometimes even neighborhood. 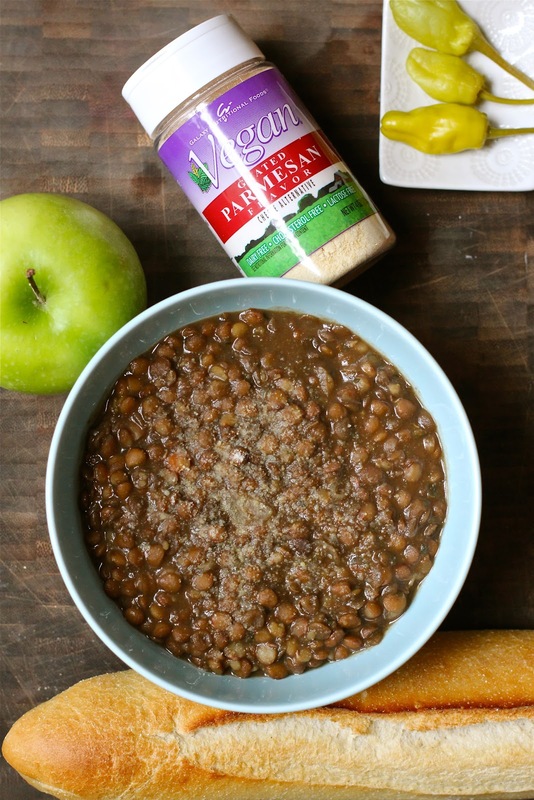 The kosher Puttanesca I had in Rome's Jewish Ghetto was actually accidentally vegan because it was their option for those with allergies or who wanted to lose weight. The ones on the menu near the Trevi fountain were not. 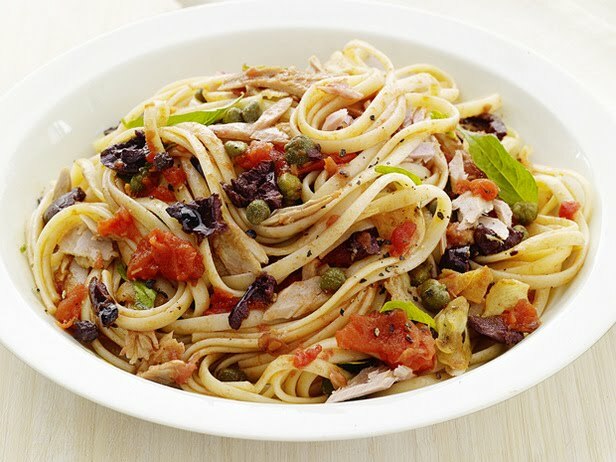 The key elements seem to be a red sauce with garlic, onions, capers, oregano, olives, basil, parsley and anchovies (although that is sometimes replaced with seaweed or in our case kelp). 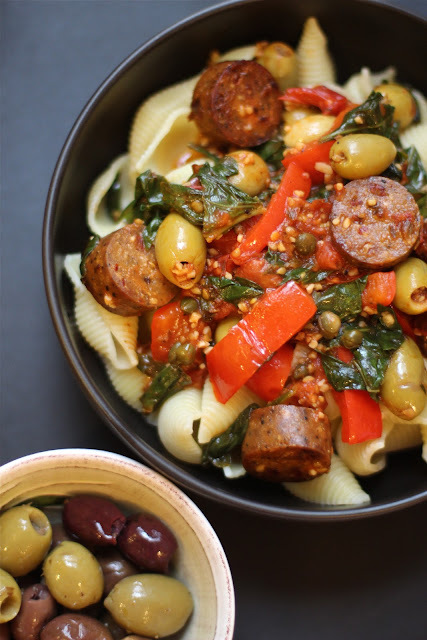 We tossed Tofurky Italian sausage, red bell peppers, spinach and played around with the ingredients a bit to level it up. It's lovely and spicy in a unique way that makes it more than just another red sauce. I know I should dive into my arsenal of adjectives to describe this better but really - it's just more. I debated if I should post this recipe today because even though this is a very easy and delicious dinner - the photos just didn't really show that. I mean this dinner has it all. 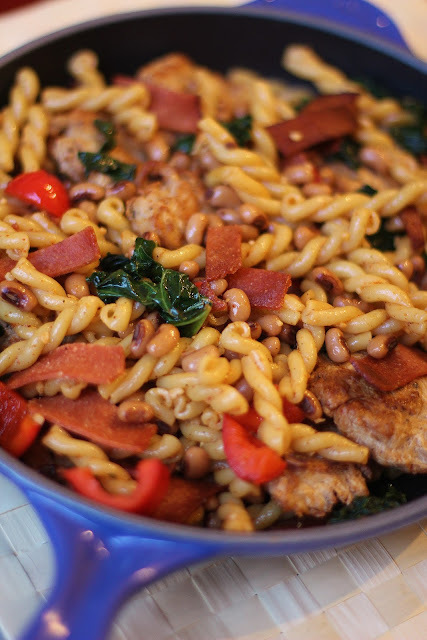 There's leafy kale, Vitamin C packed red peppers, cute little back-eyed peas, smokey vegan bacon and big Creole kick. It's great. It's also one of those almost one pot wonders that Americans have come to know as "skillets." Back in my wasted youth, my friends and I used to call each other "Home Skillet" when we were feeling what Emerson called "the comradery of peers." So I guess it makes sense that an easy dinner than requires less clean up would earn this term of endearment. I mean we loved it. During all the soul crushing recording of receipts and organizing papers that was going on around ehre last week -- there was this recipe to look forward to. Not just as a dinner but for lunch the next day as leftovers. Yeah. This dinner is my "Home Skillet." I wish I could tell you I've been busy with exciting adventures. Something hedonistic and scandalous would be fun too but sadly - no. I've been editing our book. You know the painful and slow process of replacing commas and shortening paragraphs. I took a stab at doing my taxes but moving to another state, changing jobs, paying off debts, a book advance and a mountain of receipts that need sorting have put our taxes in a whole other league. You know that one where you can't rely on google to handle the tough questions. Then there is the constant battle with the new website. This dreamy oasis of easy to access recipes and a working "As Seen On" page has continued to allude me. Sigh. And then of course there was the TV sizzle (promo reel) we shot last week. Yes. We were asked to make a promo reel to be shopped around on The Food Network and Cooking Channel. Who knows maybe you'll be able to visit with us in the comfort of your home once a week. I'm trying really hard to not get my hopes up. I'm just flattered we were asked. I'm also kinda freaking out because our Facebook page Vegan Foods = Joy has almost 10,000 fans! I know several of you have had a hard time finding us on Facebook because the page isn't called Meet The Shannons. But see the before there was ever a blog, there was a Facebook page and Facebook won't let us change the name. When you're busy with nonsense it's easy to just put on some Doctor Who and G.I.Joe cartoons and get down to work. I'm a pretty focused person and I can let other things drop off if not careful. And well I'll also be honest when I say that the internet has been seriously upsetting and disappointing me lately. This isn't where I vent so I'll save it for the next time I have too much wine but I'm pretty sure I'm not the only one who wishes that the world was kinder and that cruel people kept their opinions to themselves. Needless to say that even when I'm feeling a bit frustrated with the rudeness and ignorance of others and busy with the painful day to day of being a adult, I still eat. I'll admit that we ate a lot of lentils when we were in Greece and Turkey and you'd think I'd have enough of them but really I think that trip really just got me hooked. I've perfected a 5 Minute Lentil Soup that is so simple - well I feel weird calling it a recipe. It's just awesome. So enough chatter... To the lentils!